13th December 2010 Information on Bluetooth WM_DEVICECHANGE messages. 16th June 2010 Information from Microsoft presentation CON-T536. Slide 26: Down-Level Support For v2.1? A number of changes are apparent in Windows support for Bluetooth in Windows 7 — some of which were added to Vista in the “Windows Vista Feature Pack for Wireless” see KB942567[i]. · The first visible change is that Bluetooth devices are shown in the “Device and Printers” control panel. New devices can also be added from there. · Even better, the “Select Device” dialog — as used by “Bluetooth File Transfer Wizard” etc — is now much more useable. In XP it is completely empty until a complete discovery process has been run i.e. >10seconds. In Windows 7 the remembered devices are shown immediately and any discovered devices appear one-by-one as they are discovered. · Similarly when adding a device, discovery runs continuously and devices are added as they are found. So there’s no need to re-run the discovery if you forgot to set your device in discoverable mode. Related is that the stack uses the Bluetooth v2.1 “Extended Information Response” feature to find the discovered device’s name immediately. For any pre-v2.1 devices they will still appear initially without their names with the name being refreshed a few seconds later. · Another is the addition of “Simple Pairing”. It implement’s Bluetooth v2.1’s “Simple Secure Pairing” technology, see more below. My (old) Headset-Handsfree device pairs simply with Windows 7 without prompting the user to supply that well-known pin ‘0000’. · Finally is support for Bluetooth audio devices. After pairing the (old) Headset/Handsfree device it is immediately available as an output device in the Windows Audio control panels (HFP enabled on the headset’s Bluetooth Services tab, with the less capable HSP profile also listed but disabled). It is installed as an audio “communication device” but can be configured to be a default output device. I haven’t A2DP headphones to check whether they’re used by default for default audio. Another nice feature is that if the headset goes out of range the audio is switched to another output device, and apparently vice-versa. See the channel9 video with Larry Osterman for more information on the audio changes[ii]. Note I have a Belkin Dongle that expects to be used with the Widcomm stack. When enabling HandsFree/Headset support it won’t use the Microsoft support for this but needs the Widcomm Vista wrapper software installed. Bluetooth radio can enter Selective Suspend while connections are in sniff mode. In-box support for 100% of Bluetooth dongles. Windows 7 added: A2DP, Handsfree, Headset, and AVRCP. Previously: HID, Serial Port, OPP, PAN, DUN, and HCRP. • Bluetooth v2.1’s Extended Inquiry Response (EIR) can combine steps 1 and 2. • EIR Packet can provide, Local Name (Bluetooth Device Name), Service Class UUIDs, TX Power Level, Device ID, or Manufacturer Specific Data. • Microsoft Windows uses EIR to supply its Bluetooth Device Name and to fetch Bluetooth Device Names. Basic! Either: Choose a passkey for me, or Enter a passkey. What’s the Bluetooth Device Class? Back to a dialog like Vista's. • Device ID Profile is already required. It enables Microsoft Windows to determine: Vendor ID, Product ID, and Version. “[…] For example, pairing a Bluetooth headset and mobile phone is as easy as turning on the headset, selecting “Add Headset” from the phone menu, and then watching the phone confirm it has found, connected with an encrypted link and paired the headset. To prevent any threat of a “Man in the Middle” attack, a Bluetooth device utilizing simple pairing can provide an additional security layer by generating a six-digit passkey that the user enters to verify control of both devices. This passkey is different from a PIN code in that it is provided by the initiating device and unique to each connection sequence so that the user does not have to create or retain any codes to enjoy secure communication. The white paper[iv] explains that the technology uses “Elliptic Curve Diffie-Hellman (ECDH) public key cryptography” and that four association models are defined: Numeric Comparison, Just Works, Out Of Band, and Passkey Entry. · The Numeric Comparison association model is designed for scenarios where both devices are capable of displaying a six digit number and both are capable of having the user enter “yes” or “no”. A good example of this model is the cell phone / PC scenario. The user is shown a six digit number (from “000000” to “999999”) on both displays and then asked whether the numbers are the same on both devices. If “yes” is entered on both devices, the pairing is successful. · The Just Works association model is primarily designed for scenarios where at least one of the devices does not have a display capable of displaying a six digit number nor does it have a keyboard capable of entering six decimal digits. A good example of this model is the cell phone / mono headset scenario where most headsets do not have a display. 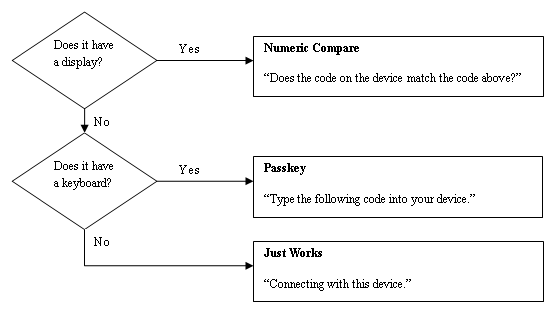 The Just Works association mode uses the Numeric Comparison protocol but the user is never shown a number and the application may simply ask the user to accept the connection (exact implementation is up to the end product manufacturer). As an example, with a Near Field Communication (NFC) solution, the user(s) will initially touch the two devices together. The user may then be asked if they wish to pair with the other device and if “yes” is entered the pairing is successful. This is a single touch experience where the exchanged information is used in both devices. · The Passkey Entry association model is primarily designed for scenarios where one device has input capability but does not have the capability to display six digits and the other device has output capabilities. A good example of this model is the PC and keyboard scenario. The user is shown a six digit number (from “000000” to “999999”) on the device with a display. They are then asked to enter the number on the other device. If the value entered on the second device is correct, the pairing is successful. For instance when I pair my (old) Bluetooth headset to my Windows 7 PC apparently the Just Works method is used —I am not prompted for the very well known pin ‘0000’. Two classes in 32feet.NET deal with authentication/bonding on Win32. The first is method PairDevice on class BluetoothSecurity which actively pairs with a peer device and is passed the device address and a pin/passphrase string. It uses native method BluetoothAuthenticateDevice, and it seems to work fine. Apparently the new BluetoothAuthenticateDeviceEx native method is only required in SSP scenarios — presumably when using Out-Of-Band pairing as it takes a BLUETOOTH_OOB_DATA_INFO parameter. The other class is BluetoothWin32Authentication which is used to passively respond to authentication requests, e.g. when we connect to a service on a device that requires authentication, it will get an event and we can return the pin/passphrase for that device. It can be used directly but it is also used internally by a number of classes (e.g. by BluetoothClient.SetPin). Since Windows XP, the Microsoft Bluetooth stack can notify applications of various Bluetooth events[v] — for instance for the making of ACL and L2CAP connections, and for devices coming into and going out of range[vi]. On Windows XP I implemented code to use the Radio-In-Range event to see whether it could be used to provide ‘live’ discovery. Unfortunately I found that the event was not raised for all devices found during discovery; instead events were only seen for ‘new’ devices — and when making (ACL) connections. Thus the events were not useful. By the way, we can surmise that the event seen on discovering a new device was by side-effect — when the PC connects to it to read its Device Name. As discussed above, in Windows 7 the built-in discovery UI uses ‘live’ discovery, so it wasn’t too surprising to find that the events now work as we’d want. When we run device discovery there’s now an event raised for every device in range (in fact there are multiple events for each in-range device). The “Windows Vista Feature Pack for Wireless” notes that new devices are added to the system discovery UI as each is discovered, so it’s likely the events work this way on Vista when that update is installed. In 32feet.NET version 3.0 RC we use that event to add support for ‘live’ discovery on MSFT+Win32 alongside all the other platforms. We also use it to enable listing “discoverableOnly” devices in normal device discovery too. Of course on Windows XP both features will only not really work, as explained above. This relates to the 32feet.NET properties LastSeen and LastUsed on BluetoothDeviceInfo. These were provided from the native API in struct BLUETOOTH_DEVICE_INFO and are documented to contain “Last time the device was seen” and “Last time the device was used for other than RNR, inquiry, or SDP”. On previous versions of Windows however these could contain invalid values, for instance after a discovery process LastSeen on all the returned devices contained ‘now’, even for devices that were not in range and thus were just being read from the remembered/authenticated store. In Windows 7 the LastUsed field does seem to be valid as before, but LastSeen still seems to contain an arbitrary value. There still seems to way to get RSSI reading on Win32. The documentation notes that Windows is using the Extended-Information-Response API with recent Bluetooth dongles so that it can get the device name quickly. This function provides the RSSI by default, and it’s a shame that there’s no API. A common request we receive on the 32feet.NET forums is how to list only the devices that are in range (and of course they have to be in discoverable mode). This is possible on both Windows CE/Mobile with the Microsoft stack and on the Widcomm/Broadcom stack, in fact on both platforms there are separate functions for getting the ‘remembered’ devices and for getting the discoverable devices. On Win32 with the Microsoft stack one API is used to list all types of device and there’s no way to get only the discoverable devices[vii]. There’s no change in this on Windows 7. MSDN shows no changes to the Winsock Bluetooth (RFCOMM) interface nor to the discovery or service related APIs. The only changes it describes are to the authentication-related APIs. There are a number of relevant additions to the header files in the Windows 7 version of the Platform SDK which we show below. The only other changes are the addition of more (precise) security annotations (SAL). [vi] For instance the Radio-In-Range event has identifier GUID_BLUETOOTH_RADIO_IN_RANGE with its data in BTH_RADIO_IN_RANGE. [vii] With the discovery API in Win32 one can’t get just discoverable devices, when calling the API one can specify flags ‘unknown’ and/or ‘remembered’. So if one asks for ‘remembered + unknown’ devices, obviously that includes both in-range and remembered devices; or if one asks for the “unknown” devices, that will correctly include only devices that are in-range but unfortunately it removes any remembered devices from list. So, in mathematical terms one can get either (discoverable ∪ remembered) or (discoverable ∩ remembered), but not just (discoverable).